This page covers Mobile Phone hardware testing and Mobile Phone repairing. It describes major hardware components in a mobile phone. This mobile phone hardware testing covers major mobile faults with possible solutions. Now-a-days use of mobile phones have been increased due to availability of cheap phones. It is used for voice calls, text messages, email, internet, photography, banking transactions etc. There are different types of mobile phones viz. bar phone, flip phone, slider phone, touch screen phone etc. Different phones will have slightly different hardware layout and mounting of panel and other components. In this article, we will understand generic components used in a typical mobile phone hardware and their repairing based on common faults. The solutions to each of the general faults have also been mentioned. 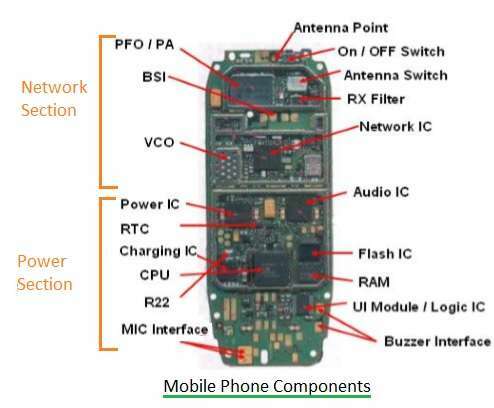 In this section of mobile phone hardware testing covers typical components used in a mobile phone hardware. The figure-1 depicts the same. The same have been covered with their individual functions in the table-1 below. Display Screen There are different types of display available. The most common are LCD. They are used to display data and interfaced with CPU to function as desired. Keypad It is used by user to key-in data as desired. It is also interfaced with CPU to function as desired. There are various types of keypad. Smartphone uses soft keypad as per QWERTY format which displays on the screen itself. Ear piece It is used to convert electrical signal to sound signal. Mouth piece It is used to convert sound signal to electrical signal. Battery It is used as source of power for all the mobile components. Power IC It derives power from battery and delivers to all the other hardware components of a mobile phone. Power Switch It is used to switch power to the mobile phone either in ON mode or OFF mode states. Charging IC It derives current from charger unit connected between AC power line and mobile phone. It charges battery of phone based on derived current. Flash IC It is the place where all the software, applications and programs are stored on a mobile phone. CPU It is the processor which controls all the parts of a mobile phone. Antenna It is used as interface to connect your mobile phone with cellular wireless network in order to obtain voice/data services. It is used to send and receive radio frequencies as per different network types such as GSM /CDMA /LTE etc. ➨The first requirement in mobile phone repairing is tools and equipments. Following tools and equipments are needed to repair and troubleshoot mobile phone. ➨The second requirement in mobile phone repairing is one should be familiar with disassembling and assembling of mobile phone. ➨The third requirement is after disassembling, do the spot inspection and check for any burned components or over heating of components or loose wires or broken wires etc. ➨The fourth requirement is segregate the main problem by narrowing your fault finding to the main issue and attack it to solve. Check the table-2 for major faults in a mobile phone and their solutions. Often the circuit diagram of a mobile hardware PCB will help to diagnose the PCB related or critical issue. ➨Use cold testing and hot testing methods using multimeter to test hardware components mounted on the PCB or motherboard of a mobile phone. Resistance is measured using cold testing where in power supply is not given to the phone. Voltage and Current is measured using hot testing where in mobile is powered on either using charger or using bench power supply. As current is measured by inserting multimeter in the series, path need to be broken or created to do the measurement. ➨Now-a-days smartphones are coming up with minimal hardware components and complete phone functionality is driven by the software. In order to do repairing, one has to download its software from internet and flash it to the smartphone using USB cable connected between smartphone and PC/Laptop. Please make sure to download the software from phone manufacturer website itself. This section of mobile phone hardware testing mentions common hardware and software faults found typically in a mobile phone. The table also mentions descriptions and their possible solutions. •mobile gets hot when connected with charger. •In order to test such issue one has to first find out whether the mobile battery has problem or charger has the problem. So use other working charger unit or battery and replace and check. One can easily narrow down the issue using this method. •If the charger unit has the problem, one need to test the voltage using multimeter. It should be typically between 5-7 Volt as written on the unit. Similarly battery voltage can also be verified. • If the battery and charger units are alright then charging IC on the mobile phone is the culprit which need to be tested and to be replaced after through testing. •Weak network signal •First check for improvement in the network signal by taking the phone in the open air if there is weak signal inside the house. •If there is no improvement then manually search the network operators and set it manually to your cellular service provider. •If the problem still persists check for respective network IC and troubleshoot as per its specifications. Often other nearby ICs such as crystal oscillator IC, power IC or CPU IC also might have become faulty so if required change them also one by one and see the result. Overheating Phone may overheat either due to hardware or software (applications). •Check whether one particular application is causing the issue. •Sometimes phone may overheat by running multiple applications simultaneously. •Mobile phone PCB can also cause this problem, if required change and see the result. Sound related faults •Earpiece or microphone problem •ringer issue•vibration issue etc. •common issues are low sound or no sound etc. •Check for speaker volume level in the phone and increase it. •Replace the Audio IC or power IC (UEM). •Change the ringer or buzzer or I.H.F. speaker. Display fault Display not working •First check for software setting such as brightness level etc. •Next check for display IC located between display unit and CPU. Keypad issues •Keys do not work •requires more pressure to insert key etc. Check whether keypad is properly fixed on the motherboard, also check contact of keys as desired. if required change keypad or keypad IC or interface IC to see the result. WiFi or internet related problems •Internet is not available•low wifi signal strength•Wifi not getting enabled. •Check for wifi security password and username is valid •check wifi AP or router on the other side is powered on and antenna is properly inserted. • If the problem persists, check the wifi IC and its location on the mobile phone PCB. Software or application fault •phone is not getting powered on •phone went to test mode•phone not charging•phone gives message to contact service provider •phone hangs etc. •Download Operating System and install it. •check whether any one particular application is causing the issue. If required download fresh copy and install it after uninstalling earlier one. •reset the phone to its original factory settings. This article helps in mobile phone hardware testing and mobile phone repairing.